Whether players are infiltrating an enemy stronghold or defending against invading troops, the possibilities for adventure are endless with Pathfinder Flip-Mat: Bigger Keep. 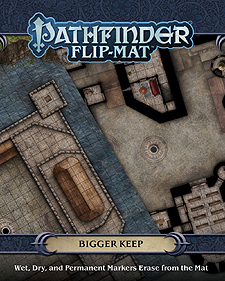 With an area that's 45% larger than normal Pathfinder Flip-Mats at their disposal, Game Masters can now dream even bigger! This massive gaming accessory presents an extensive multi-level keep, complete with an armory, arrow slits, a drilling yard, guard towers, a mess hall, a moat, and a shrine for valiant defenders. Don't waste your time drawing every turret, drawbridge, and crenellation. With Pathfinder Flip-Mat: Bigger Keep, you'll be prepared the next time your players decide to scale the walls!